Enjoy all the benefits of city and apartment living with the feeling of a single-family home, complete with multi-level patios and backyard. 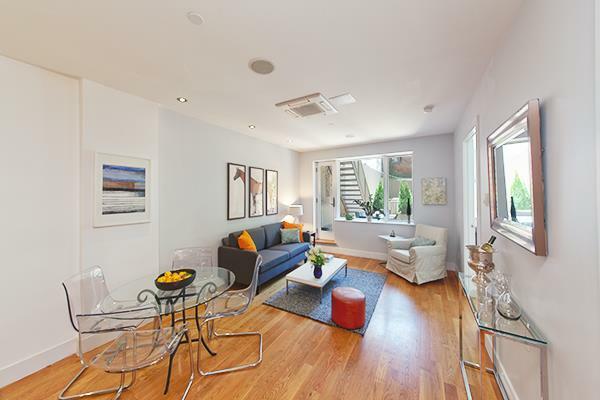 Built in 2008, this beautifully upgraded, mint-condition 1471-square-foot duplex features a 942(approx)-square-foot private garden. Perfect for relaxing, grilling, entertaining or working from home. Currently configured as a 2 bedroom, 1.5 baths, plus a media room/office wired with the latest technology with two home offices. The media room/office can easily be converted into a 3rd bedroom. Prepare to fall in love with luxurious design details, including custom closets, shelving and lighting, a built-in sound system with iPod dock, Bosch washer/dryer and a full chefs kitchen with Bosch and GE Profile stainless steel appliances. This home has 7 closets and several hidden storage areas. To top it off, 1B also comes with a deeded storage room with enough space for bikes and other items, as well as a private gym. This boutique building provides access and privacy all at once. A quiet haven conveniently located in leafy Prospect Heights (voted top ten neighborhood in NYC by New York Magazine), it is steps from the vibrant restaurant scene on Vanderbilt Ave, and is in close proximity to the 2,3,C,B, and Q trains, as well as PS 9 School, Grand Army Plaza, Prospect Park and the new Barclay's Center. 662 Bergen street has a 25-year tax abatement through 2032, keeping your monthly payments extremely low and is only 15-20 minutes from Manhattan by subway. For an appointment, please contact Aran Scott at (646) 479-8408 or email ascott@space-ms.com. *Please note that in the original offering plan, this unit is listed as a 1BR +recreation room. For more information or to schedule a private showing please contact Aran Scott.